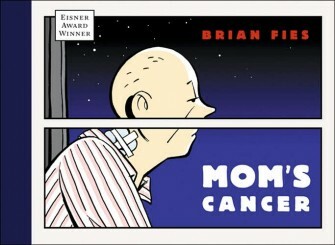 This is a a book collection of Brian Fies' much talked about on-line comic about his mother's extended bout with lung and brain cancer, a work that in its on-line iteration won an Eisner for Best Digital Comic in 2005. A lot about the work remains alternately charming and powerful. A reserved narrator, Fies nails down the reasons behind his general reaction and those expressed by his siblings in very clear, direct and understanding way. The details of the inter-family relationship prove interesting -- a grandfather's alien prophecy born out of years of loneliness, a difficult stepfather whose move away from the family could not have come at a worse time, his mother's curious way of using denial and will cluelessness to keep a thread of hope going. The best and most familiar work to anyone in a family where a member gets sick is how arbitrary and haphazard the system of diagnosis and care feels, as if every single sick person is the first patient ever and must guide themselves through a world with very few concrete landmarks. I also enjoyed how Fies built on this element of his mother's care to build a positive message from her story -- that not only are we all responsible for our own health, happiness and life choices, but that we have to negotiate the downside of that with as much understanding from others as we can muster. All that being said, the book collection reveals a lot that keeps Mom's Cancer from first-rank comics status. Without that time in between installments to dwell and muse and mull over the previous chunk of information, a lot of what's presented seems underdeveloped, too quickly wrapped up in statements or proclamations of meaning. A later visit with the father lacks the nuance of the previous visits and feel arbitrary in its change of perspective. A diatribe against smoking traffics in none of the human detail of any of Mom's appearances and feeling jarringly out of place. An anecdote about Mom being a movie extra feels forced. It's in reading it all in one place in one sitting that Mom's Cancer pulls away from a deeper extended experience of the sickness and treatment to makes the reader realize that she's not along for the journey, only looking in on series of sound bites, intermittent visits prepared and staged beforehand by Fies' sympathetic hand. It may be that it's impossible to get past a certain remove from someone else's story, but great art might make us feel that the distance is closer, or at the very least recognize that limitation on intimacy and use it for a unique set of insights. This is a nice book, and what doing it meant for Fies and his family lies beyond criticism, but its value as art falls short of its promise and the best of its component parts.